On June 19, 2014, the Federal Energy Regulatory Commission (FERC) issued a declaratory order holding that the Federal Power Act (FPA) preempts state and local regulatory authority over a hydropower project under Washington State’s Shoreline Management Act (SMA). FERC’s order resolves potentially significant delays in construction of the hydropower project under state law and allows construction to proceed immediately as authorized under the FERC license. Van Ness Feldman authored the petition for declaratory order. The Public Utility District No. 1 of Snohomish County, Washington (the District) received a 10-year pilot license from FERC for the Admiralty Inlet Pilot Tidal Project (Project) on March 20, 2014. The 600-kilowatt experimental hydropower project will be located in Puget Sound in the state of Washington. Under section 307(c)(3)(A) of the Coastal Zone Management Act (CZMA), FERC cannot issue a license for a project within or affecting a state’s coastal zone unless the state CZMA agency concurs with the license applicant’s certification of consistency with the state’s CZMA program; however, the agency’s concurrence is conclusively presumed by its failure to act within six months of its receipt of the applicant’s certification. A state SMA permit is required for the Washington State Department of Ecology (Ecology) to issue a consistency certification for the Project under the CZMA. Island County’s SMA program requires a shoreline permit for utility uses within 200 feet of the shoreline. The District applied for a consistency certification from Ecology and a shoreline permit from Island County in 2012. The District received a shoreline permit from Island County and prevailed on appeal of the permit. Under a condition of the permit, construction is automatically stayed until 21 days after Ecology’s final approval of the permit, or, if an appeal is filed, until after the appeal is concluded. Two parties appealed the shoreline permit, and construction was stayed under state law. In January 2014, Ecology informed FERC that, according to the U.S. Department of Commerce, Ecology had inadvertently waived its CZMA certification authority over the Project. Under prior case law, when a state’s CZMA authority has been waived, the FPA preempts the state’s SMA. While the District was still willing to comply with most of the conditions of the shoreline permit, even though it was no longer required under federal law, the condition requiring an automatic stay on construction pending the outcome of the shoreline permit appeal would have prevented the District from commencing construction of the Project under the FERC license. For that reason, the District filed a petition for declaratory order asking FERC to find that the FPA preempts state and local authority under the SMA, and the shoreline permit is not required. The District argued that the stay of construction under state law prevents it from implementing the terms of its license, which authorizes immediate construction of the Project after pre-construction approvals by FERC. The stay could also cause the District to miss specific work windows, and ultimately delay construction of the Project, as authorized under the FERC license. Because Ecology waived its CZMA authority, the District argued that a shoreline permit under the SMA was no longer required as a matter of federal law. FERC granted the District’s petition, ruling that where the state waives its CZMA authority, the FPA preempts state and local regulatory authority under the SMA. FERC found that the FPA’s comprehensive federal licensing and regulatory scheme occupies the field, and compliance with a state-imposed stay under the SMA is not required and could significantly interfere with the District’s ability to timely construct the Project. While FERC encourages licensees to comply with state and local requirements, such compliance is not required when it conflicts with requirements under the FERC license or frustrates the purposes of the FPA. Moreover, because Ecology waived its CZMA authority, FERC found that a shoreline permit was not required as a matter of federal law, and the District is not required to comply with the state-imposed stay on construction under the state permit. To hold otherwise, FERC explained, would be inconsistent with the FPA, because it would allow a state permit to stay a FERC license. 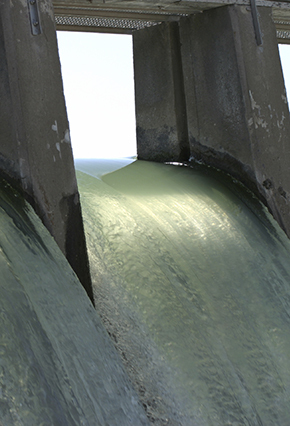 While FERC encourages licensees to comply with state and local laws governing hydropower projects, FERC’s order in this case reaffirms the application of field preemption to state and local laws, at least when compliance with such laws conflicts with a licensee’s ability to implement a FERC license. This is significant for licensees who attempt to implement license obligations but are barred or delayed by state and local regulatory authorities with standards that conflict with the license. Van Ness Feldman’s hydroelectric and public land and natural resources practices provide comprehensive legal, policy, and business advisory services for the full range of issues affecting these matters. Van Ness Feldman’s decades of experience cover every aspect of these matters, ranging from transactions and land use planning to licensing, permitting, regulatory compliance and litigation. If you would like additional information, please contact Mike Swiger, in our Washington, D.C. office at 202-298-1800, or Matthew Love, in our Seattle, WA office at 206-623-9372.